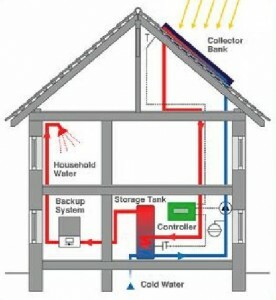 Suntrader » SOLAR THERMAL » How does it work? The collector is attached on top of the roof tiles or on an aluminium frame if a flat roof is the best available option. The collector receives solar radiation and heats the solar liquid circulating through the collector and this is pumped into a solar cylinder where it heats the stored domestic water. This process is regulated automatically by a solar controller (Fig. 2) which constantly compares the temperature of the solar collectors with the temperature of the water in the cylinder. 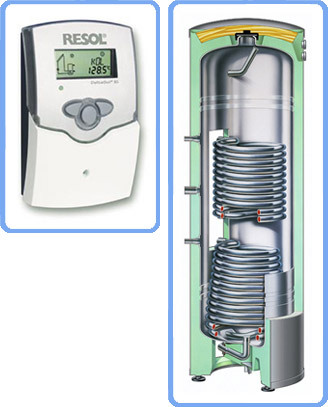 Whenever usable heat in the collector is available the controller switches on the system’s circulating pump to transfer the heat to the cylinder. If the water in the solar tank is not warm enough, your existing boiler will top up the water to the required temperature. The new solar cylinder (Fig. 3) which is normally fitted in your airing cupboard replaces your old hot water cylinder. The new cylinder has two coils, the bottom coil linked to the solar circuit and the upper one to the existing boiler circuit. Our experience says that in hard water areas like the south of England, old cylinders are clogged up with limescale which in turn requires more fuel to heat the water. With a new cylinder you will achieve a solar gain and also increase the efficiency of your boiler. Sometimes it is advisable to fit a de-scaler to protect your new system. De-scalers are not expensive and protect all appliances linked into the water circuit (dishwasher, washing machine, pipework etc).